Online car insurance – how hard can it be? Every year I then devote the best part of a couple of hours or so out on the InterWebs searching to see what the best car insurance deal is for mum. It’s not like we are insuring a Ferrari or anything, it’s just a harmless old Nissan Pulsar but Mum has grown quite attached to it. Takes her shopping, lets her do her Meals-on-Wheels delivery and generally gets her around. So, every year I spend a few hours and find her the best deal I can. Those that know me too know that I hate “dicking” around. Systems should make it easy for me to do things, not harder. They should speed the process up, not make it longer. Right then, let’s have a look at a couple of fun moments from my recent searching. First off though, I should mention that Youi Car and Home Insurance has been her insurer for the past two years. Before that it was AAMI. We had a quote from them already as part of the renewal notice. The first of the failures was QBE Insurance. I spend about 10 minutes stepping through all the questions, identifying the vehicle, recording details of all the potential drivers, recording my mother’s details, what the agreed amount was that we were looking for insurance for and whether we wanted excess protections etc. When I got to the end of all this and clicked the “get quote” button, the image on the left was returned. 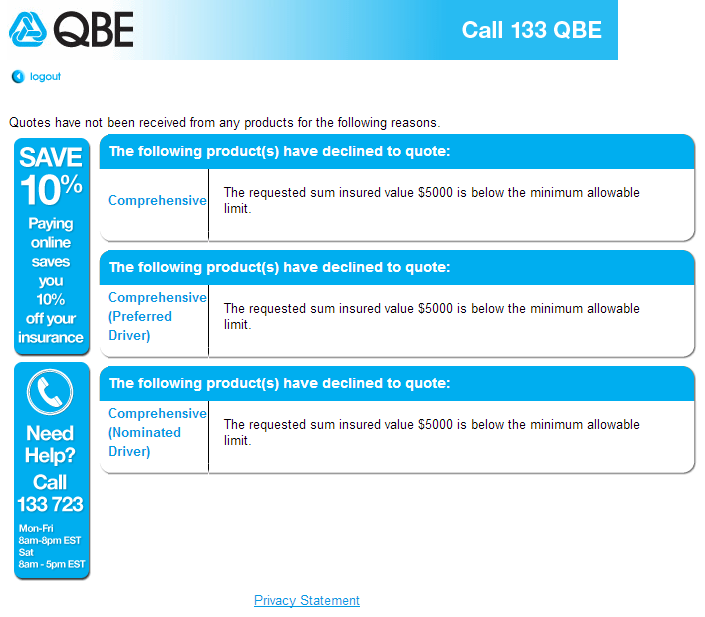 Yep, after asking me how much insurance I wanted the system went ahead with the other 50 questions and only when I had completed every question including how much insurance was required, QBE then told me that the amount of insurance requested was below the minimum amount they will deal with. In Twitter terms …. #fail! Of course, the other thing about this is that there is no link backwards to change any of the information given, like did I want to increase the amount of insurance. http://www.budgetdirect.com.au/ was the insurance quote system to annoy me. Again, after answering the 50-odd questions, plugging away to the end the one thing that I had not answered was any amount for the insurance (“agreed value” in Australian terms). I progressed through and the screen to the right was eventually returned. The lump sum payment amount was nice – it was about $20 cheaper than Youi. However the issue was that now where did Budget tell me what the insured value was. They mentioned “market value” only which could be any value really. It was not specified. So budget wanted $512.33 of my mother’s hard earned money for an unspecified amount of insurance. #Fail! The other nasty thing about Budget – look at the instalment option. Pay back over 12 months on a month-by-month basis and pay $599 instead of $512 – and $87 premium for paying by the month on an agreed insurance value that presumably is going to get smaller as the year progresses. Another #fail. There were some other annoying things as well – GIO Car Insurance for example. After answering the questions they came up with a quote that was around about the same level as Youi. The only problem was it was for about $2,600 over insurance coverage whereas Youi was $4,750. The other thing I noticed is that same quotation system is used between many insurers. That is not surprising as many of the insurers are owned by the same company, Suncorp.